In the Exporting your video panel that appears to the left, type the name you want your exported file to have and select your desired Video Quality from the dropdown. The default resolution is 480p (SD) and is free. The higher resolution of 720p (HD) is available to users on the Creator Plan and above, or for a one-off fee. The highest resolution of 1080p (Full HD) is available to users of the Business and Business Platinum Plans, or for a one-off fee. One-off payments will only be charged once the video exports successfully (so if the export is cancelled or fails, you won't be charged). NOTE: higher resolutions will take longer to export. 3. 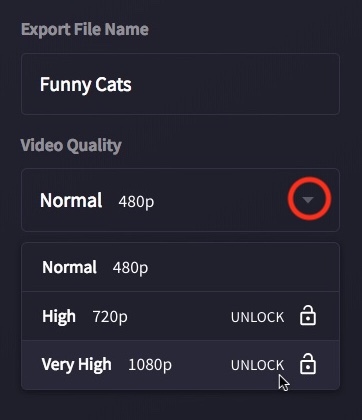 Click the purple Export video button. 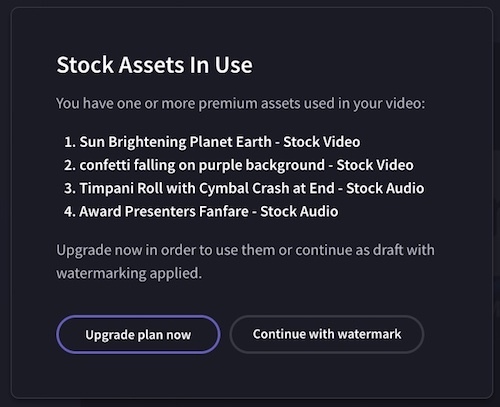 NOTE: if you've used stock video or audio files in a project and you're on a free plan, you will see a popup reminding you that your video will have watermarks on these assets unless you purchase them individually. You can choose to upgrade to a Create Plan that includes access to stock assets, pay a one-off fee, or export the video with watermarks. 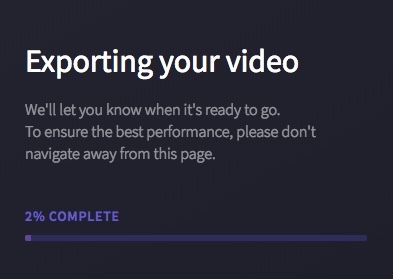 If your video is slow to export or doesn't export, see this help article for tips on how you might be able to improve the export speed. Once your video has been exported, you will be taken to a screen where you can watch the video and save it. Click Save my video to save it instantly to your computer. IMPORTANT: if you don't click save my video your export will not be saved! 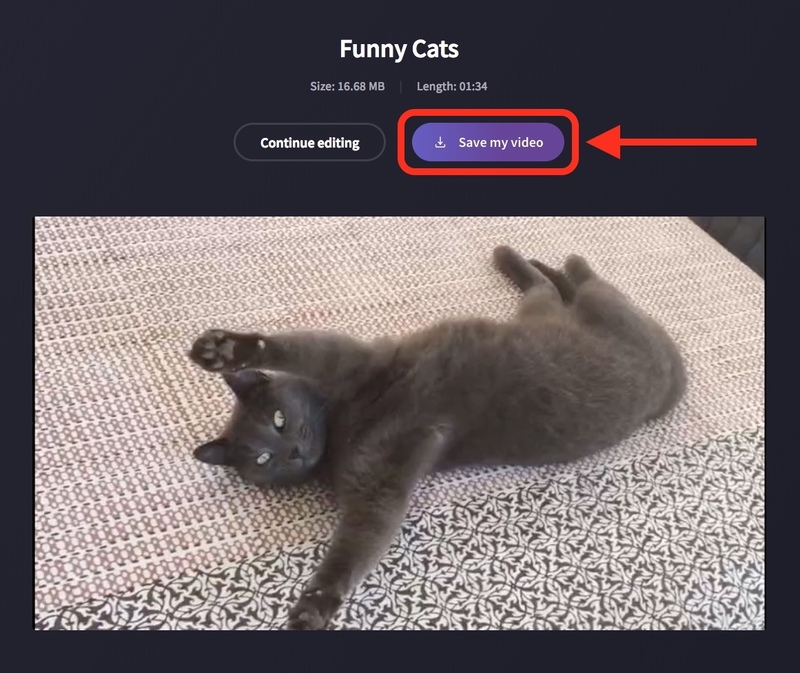 Depending on your browser's save settings, the video will either be saved straight to your Downloads folder, or a menu will appear so you can select where you would like to save it. If the latter, choose a folder to save it to and click Save. Your exported video will be an MPEG 4 (.mp4) file with the file name you chose. The frame rate will usually be 30fps. If you want to convert your exported video to another format, e.g. 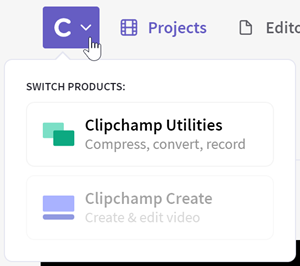 WebM or FLV, we suggest using the Clipchamp video converter utility. You can easily switch to the Utilities dashboard using the C icon in the top left of your screen. If you have problems or encounter errors when exporting your video, please see this article for a number of troubleshooting tips that may help you to export successfully.